Posted on 23 Dec 2013 @ 16:36 by Brent P.
Jekyll Island, Georgia even today remains a secluded place where those inclined to make secret plans would still have reasonable privacy. Thick vegetation still encircles much of the island. The place exudes a strange blend of quaint charm and foreboding arrogance. Local museum photos reveal this seclusion was even more pronounced back in October of 1910, when Rothschild banking agent Paul Warburg of Kuhn, Loeb & Company and six other major figures met there to plan what became the Federal Reserve System—a system which turned 100 years old as of Dec. 23, 2013. A framed picture arrangement of the key Fed planners is still placed above the fireplace, which preserves the inescapable fact that this “Fed room” remains an elegant crime scene even today. The wealthy, stealthy comrades who a century ago hammered together their central-banking scheme evaded reporters by sneaking aboard a southbound train in October of 1910. Departing from Hoboken, N.J., these Fed founders disguised themselves as duck hunters while using only their first names. People think that the US is the only place playing games with their fiat currency. Fact is, the entire world is doing this and the whole world economy is a house of cards. China and Japan are in the middle of a currency war to sell their cheap garbage world wide as we speak. It is unsustainable. The blue line represents inflation as defined as the cost of maintaining a set standard of living, not a declining standard of living. 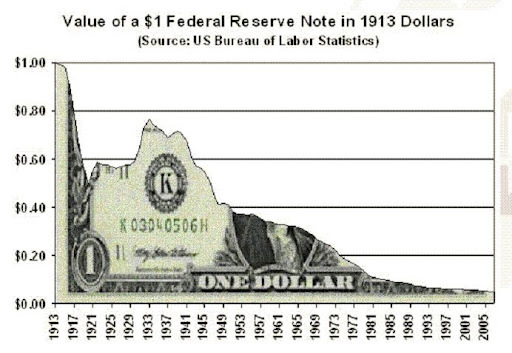 From the perspective of the global financial elite aka communists/fascists/statists in business suits, I'd say the Fed has been a resounding success. The global financial elite have been quite busy.